continues onto the Route 56 Bike path towards the coast. Please be aware of traffic on Carmel Valley Rd. Please run against traffic. Once on the bike path, please share the path with pedestrians and cyclists by running no more than two abreast. The bike path enters a gated community and Coach Paul is asking for your respect of the neighborhood as you run through. Once you enter the Carmel Mountain Preserve, please share the path with horses, pedestrians, and cyclists. Start at Fleet Feet Sport heading out to Carmel Valley Rd. L – Carmel Valley Rd. Please cross with caution to the Route 56 bike path. R – Route 56 Bike Path. Proceed on paved trail and enter Palacio Del Mar neighborhood. Please be respectful as you enter the gated community. Continue west to WS1 at the Carmel Mountain Preserve Lot. Please share the road with horses, pedestrians, and cyclists. Continue west to WS2 at El Camino Real. Continue west to the turnaround point where the paved trail ends. 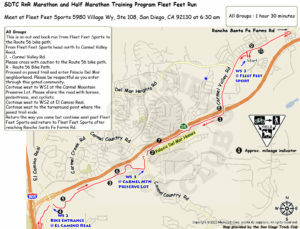 Return the way you came but continue east going past Fleet Feet Sports and then returning to Fleet Feet Sports after reaching Rancho Santa Fe Farms Rd. There are no restrooms or water fountains on this trail. Run no more than two abreast and share the path with horses, pedestrians and cyclists. Carmel Valley is one of the newer neighborhoods of the City of San Diego, California. The community was formed by the City of San Diego on February 1, 1975. The construction later began in 1983. The name Carmel Valley comes from the Carmelite Sisters of Mercy, who established a dairy farm and monastery in the area c. 1905.